Wireless traffic is growing at a phenomenal rate. AT&T says their cellular data traffic grew 80,000% (that's 800 times) between 2007 (the introduction of the iPhone) and 2017. The landscape is covered with cellular towers but the majority of cellular connections (70-80% for both voice or data) originate inside buildings, so wireless coverage inside buildings has become more important. Cellular wireless signals often cannot penetrate walls and even windows in large buildings, requiring low-power cellular antennas placed inside buildings to provide reliable service. There are several other reasons for cellular systems inside buildings or structures. Sometimes the number of users inside a building like a convention center or sports facility exceeds the bandwidth of a single cellular system. In many areas, local laws specify the need for public safety radio signal coverage (fire, police, emergency) inside every building that requires indoor antenna coverage. And auto or mass transit tunnels are also obvious applications for cellular antenna systems. Levi's Stadium for the San Francisco 49ers has over 700 DAS antennas to serve 70,000 people. A smaller DAS may pick up cell signals from an outdoor antenna to connect indoor antennas to the cellular systems of various carriers through a network of coax cables and amplifiers. That might work for small systems, but not for systems with large numbers of users. These systems generally connect to fiber backhaul like a cell tower and distribute signals inside the facility digitally over fiber. A DAS may be "carrier-owned" where the system sometimes only handles the carrier that owns the system but may handle other providers, or "neutral-host" where one private system handles multiple carriers and sometimes other systems, e.g. WiFi. Equipment, labor, and maintenance costs for deploying in-building systems can be expensive and wireless providers find it difficult to justify the ROI for such systems except for the very top tier venues. By utilizing a neutral host model, multiple carriers share the cost associated with these installations while improving subscriber satisfaction and ultimately increasing minutes of use on their system. Since the cost associated with providing service to in-building and other underground or RF (radio frequency, e.g. wireless) resistant environments is shared among multiple carriers as well as the system owner in a neutral Host DAS model, the medium and smaller venues are becoming economically feasible. A small "Passive" DAS is simply repeaters for signals to/from an outside antenna. The electronics amplifies the signals and connects remote antennas over large (12-25mm/0.5-1inch) coax cables. Besides the obvious noise problems with all analog systems, the coax cable runs were limited to about 100m (330ft) making this a difficult system to use in large buildings or structures. Passive systems have been used mainly in small to medium sized buildings - ~10,000-200,000 sq ft size - and are being replaced by active digital systems. This modern solution distributes the signal inside the building or facility over fiber as digital signals. Although there have been some systems that use RF over fiber inside the building, it’s not common anymore. A DAS has to connect to service providers which is done with fiber backhaul to all the service providers for large facilities and may be done by wireless antennas on the building for smaller facilities. Fiber backhaul enhances service by providing greater capacity and simplifies installation since coax cabling to the carrier antenna is not necessary. 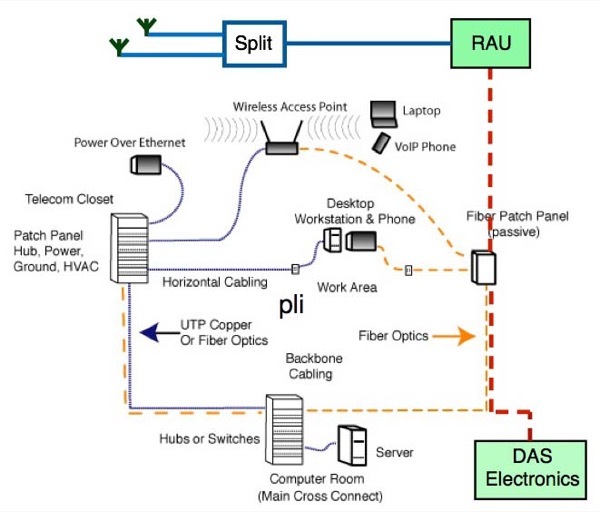 Digital signals over fiber for a DAS inside a facility generally use one of two standards - CPRI or OBSAI. Many systems use CPRI - The Common Public Radio Interface –to connect the BBU and RRU. CPRI is an industry cooperation aimed at defining a publicly available specification for the key internal interface of radio base stations between the Radio Equipment Control (REC) and the Radio Equipment (RE). The parties cooperating to define the specification are Ericsson AB, Huawei Technologies Co. Ltd, NEC Corporation, Alcatel Lucent and Nokia Siemens Networks GmbH & Co. KG. Open Base Station Architecture Initiative (OBSAI) was a trade association created by Hyundai, LG Electronics, Nokia, Samsung and ZTE in September 2002 with the aim of creating an open market for cellular network base stations. The hope was that an open market would reduce the development effort and costs traditionally associated with creating base station products. The block diagram here is generic – there are currently no widely-accepted standards - practically every manufacturer of DAS systems has different names for the various operational blocks and even some unique architectures, for example using PONs (passive optical networks) like OLANs and FTTH. But the idea is to get wireless signals to numerous remote antennas over fiber. Some systems convert to coax at remote antenna units (RAU) and then distribute to numerous low-power antennas, often multiples through coax splitters, covering small areas. Other systems use active antennas that only require a fiber connection and power, the electronics are built into the antenna like the new small cell antennas. Active DAS systems are used in larger buildings, up to 1milion sq ft. 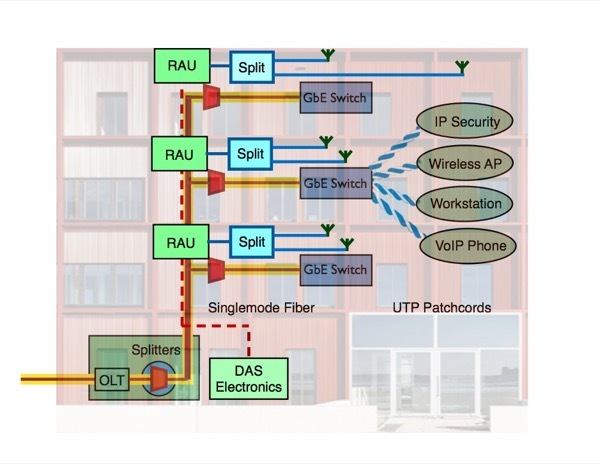 The architecture of DAS cabling is not much different from an Ethernet LAN or standardized structured cabling and most systems operate on singlemode fiber. In some cases, DAS systems can be monitored by network management software used for LANs. DAS and WiFi networks are both usually included in an installation since both serve similar purposes. Smartphones will generally choose to operate over WiFi networks for data when WiFi has more available bandwidth. DAS is also compatible with a passive OLAN system since both use SM fiber and similar backbone cabling architecture. There are no "standards" for DAS design, although some organizations which develop structured cabling standards are attempting to develop either standards or guidelines. The problem is the variety of systems and components that are very different from Ethernet LAN components, for example, where all components are essentially identical in function and interoperable. In a DAS, various manufacturers may use components and layouts that are different enough that a standardized cabling system would not be able to accommodate them and the variations in buildings make antenna location somewhat unpredictable. A standardized design for a new building might put antennas on a grid for convenience in installing cabling, but the antennas in the actual building may not provide adequate coverage. This a DAS will be a custom design with optimized architecture based on site testing, not something designed around some simplistic cabling guidelines, but will use the typical components (mainly singlemode fiber) of the structured cabling standards. DAS design is typical of wireless networks. Wireless networks depend on proper positioning of antennas and access points to get proper coverage for users. 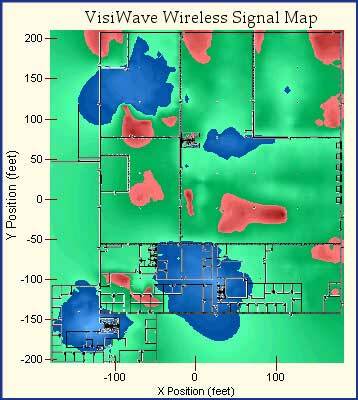 The locations of antennas will be determined by a site survey using RF test equipment similar to the site survey done for WiFi. RF signals are hard to predict inside buildings as different building materials and layouts will affect signal coverage, so site testing is important. Various vendors have different equipment available, including different architectures and even power levels. The lack of standardization in the equipment means that cable plant design must follow the choice of equipment vendors. The total number of antennas and placements will require a comprehensive analysis, but one guideline seems to be one antenna for ~100 users and perhaps 1-2 antennas per floor of a building. Outdoor locations may require antenna designs to be camouflaged for architectural reasons, for example on historic buildings or neighborhoods. Indoors the antennas are usually placed on the ceiling. There are even antennas that can clamp on railings in large venues like sports facilities. 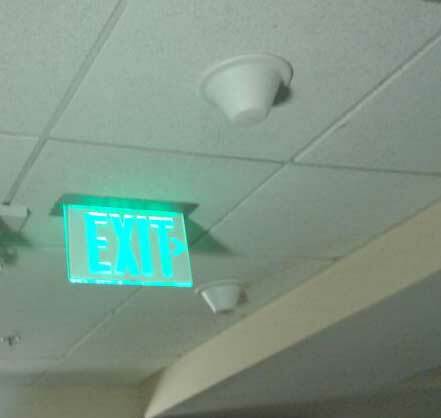 RAUs are usually placed inside of existing telecom rooms. Indoor mini antennas (the size of smoke alarm) could be placed in boxes and other interior areas or placed within dropped ceilings. Since RAUs are relatively small, the space and power requirements may be accommodated by current telecom room design. 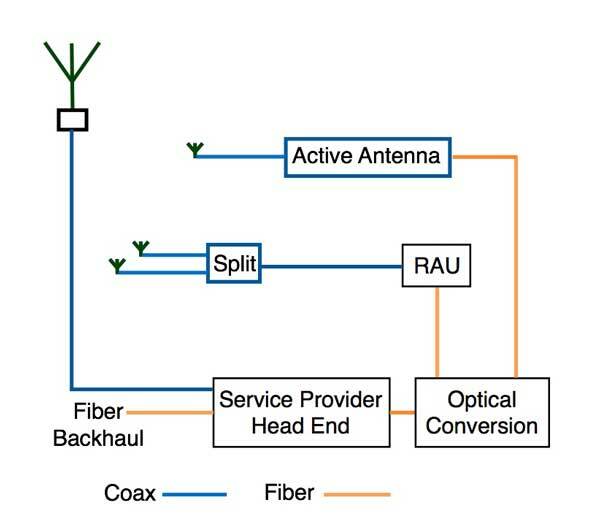 Connection from RAUs to antennas is generally on coax so placing coax must be included in designs. Entrance facilities have special requirements. Neutral host systems will have to accommodate 4 or more service providers so entrance facilities must be designed to allow adequate entrance conduits and space for equipment. AT&T has recommended approximately 10’ x 30’ area (~3 X 10m), inside or outside for AT&T freestanding facility for equipment location (“head end room”) for their equipment in a medium-large facility, additional space may be required to accommodate equipment from the other wireless carriers. AT&T also recommends 200A service for the head end. DAS systems are sometimes all indoors, like in a convention center, or outdoors like a sports stadium, or a combination of both, like a college campus. The type of location will determine the types of components and installation techniques necessary. A modern DAS system will use fiber to connect the head-end to the RAUs and coax to the antennas. 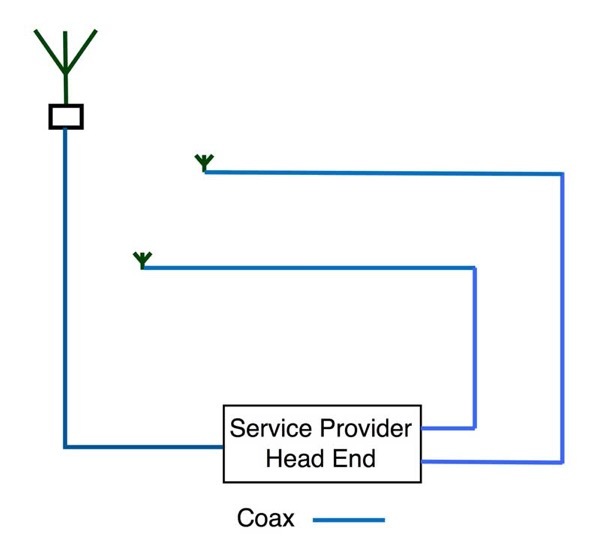 Installers should be familiar with both fiber and coax installation and testing. Besides the head end, RAUs like WiFi access points will also require power, another consideration in the design. Installation follows normal procedures for premises or OSP fiber optic cables. If useful fibers are available in current cable plant, one can patch in the equipment. If new cables are needed, follow usual installation guidelines. Field terminations should use spliced on pigtails or prepolished splice connectors (field polishing of singlemode terminations is discouraged due to the difficulty of controlling reflectance.) If small fiber counts are needed, it’s possible to use prefab assemblies where the installation is simple but care must be given to cleaning and inspecting every connection. With short SM links, loss should not be a problem but reflectance can cause transmission problems. Every installation program should include testing cables for insertion loss with a light source and power meter. This test works just like the communication system works with a source (transmitter) at one end and a meter (receiver) on the other end. If properly done, an insertion loss test is the most valid way to evaluate a cable plant for use with a typical communications system, but higher speed systems require additional tests to find problems like reflectance or dispersion. OTDR testing may be used for troubleshooting if a high resolution OTDR is available that can resolve the short cables typical of a DAS system. Testing the short cables for DAS is similar to the testing issues for FTTA (fiber to the antenna) so we recommend you read the page on testing FTTA. Dirt is the #1 enemy of fiber optic connectors because it can cause loss and reflectance, even damage connectors. Inspect every connector before you make a connection with it. Check the connector and the receptacle it will be plugged into as either or both may be dirty. More on wireless in premises systems including wireless network standards . Comparing WiFi, Small Cells and DAS. FOA Guide Table of Contents.